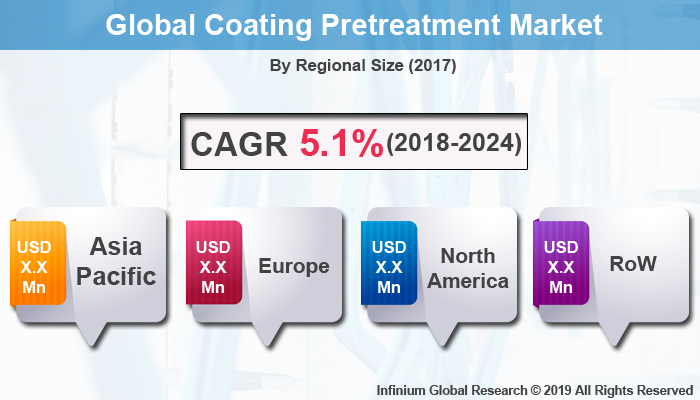 A recent report published by Infinium Global Research on coating pretreatment market provides in-depth analysis of segments and sub-segments in the global as well as regional coating pretreatment market. The study also highlights the impact of drivers, restraints, and macro indicators on the global and regional coating pretreatment market over the short term as well as long term. The report is a comprehensive presentation of trends, forecast and dollar values of the global coating pretreatment market. According to the report, the global coating pretreatment market is projected to grow at a CAGR of 5.1% over the forecast period of 2018-2024. Coating pretreatment is a method in which metal surfaces are cleaned before the application of powder coating. During the pretreatment process, Oils and other contaminants such as grease, dirt and an outer oxide layer are removed from the meat surface. The pretreatment process is necessary to improve coating adhesion, reduce the rate of surface corrosion and provides a long life of the coating to metal surfaces. The number and type of pretreatment steps depend greatly on the condition of metal being introduced to the system. The coating pretreatment coating market is driven by growing demand from various end-user industries such as construction, automotive, furniture, aerospace, and electronics owing to its ability to offer product durability by protecting their components against corrosion. The benefits offered by coating pretreatments such as durability and protecting the metal against corrosion is promoting the growth of the market. Additionally, rapid growth in residential and commercial construction and infrastructural development across the globe and rising demand for powder coatings are some factors fueling the growth of coating pretreatment market. However, environmental concerns owing to toxicity issues regarding metal finishing could be restraining the growth of the industry. The growing need for coating pretreatment in vehicle parts includes engine components, fuel tanks is anticipated to create lucrative growth opportunities for the growth of the market during the forecast period. Furthermore, the growth in the aerospace industry is due to growing consumers air travel demand owing and increased consumer’s disposable income. Metals are widely used in manufacturing airplanes, which provides growth for coatings pretreatment market. On the basis of region, Asia Pacific is accounted to be the largest share in the global coating pretreatment market owing to rapid growth in commercial and residential construction coupled with infrastructural development. The growth of the coating pretreatment market in countries such as India, China, and Japan is anticipated to escalate market growth in Asia Pacific region during the forecast period. Europe is expected to be the second largest region for this market due to the presence of major automotive manufacturers presence in Germany. Additionally, the developing construction industry in the Europe region is expected to drive market growth in the coming years. The North America region hold a significant share in coating pretreatment market due to the presence of major end-use industries such as construction, automotive and aerospace. Middle East & Africa is estimated to show substantial growth as it is a hub for the construction sector. The report on global coating pretreatment market covers segments such as the metal substrate, type, and application. On the basis of a metal substrate, the sub-markets include steel and aluminum. On the basis of type, the sub-markets include chromate-free, phosphate, chromate, and blast clean. On the basis of application, the sub-markets include automotive & transportation, appliances, and construction. The report provides profiles of the companies in the market such as Kansai Paint Co.,Ltd., Axalta Coating Systems, The Sherwin-Williams Company, Akzo Nobel N.V., 3M, NIPPONPAINT Co. Ltd., Nihon Parkerizing Co.,Ltd., Henkel AG & Co. KGaA, and PPG Industries Ohio, Inc.. The report provides deep insights into the demand forecasts, market trends, and micro and macro indicators. In addition, this report provides insights into the factors that are driving and restraining the growth in this market. Moreover, The IGR-Growth Matrix analysis given in the report brings an insight into the investment areas that existing or new market players can consider. The report provides insights into the market using analytical tools such as Porter's five forces analysis and DRO analysis of coating pretreatment market. Moreover, the study highlights current market trends and provides forecast from 2018-2024. We also have highlighted future trends in the market that will affect the demand during the forecast period. Moreover, the competitive analysis given in each regional market brings an insight into the market share of the leading players.